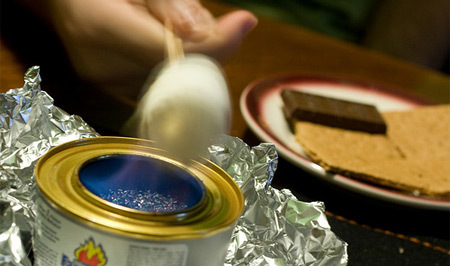 We never made it camping this summer, so last weekend we took the smores indoors with a can of chafing fuel. They taste just as good, though I do miss the smell of a campfire! We do them with just a candle sometimes! This is a great picture. Indoor s’mores rule. My wife is a smore nut! Campfires, fireplace fires, she’ll stop at nothing. It’s really the only way I can drag her out to a campsite in the summer. Nice pic! Love the framing!